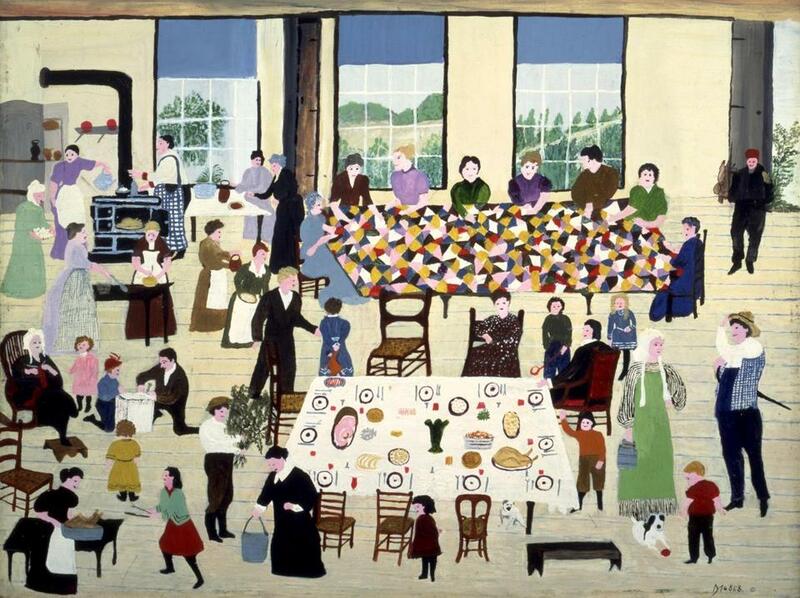 How modern was Grandma Moses? BENNINGTON, Vt. — Grandma Moses has a branding problem. Some critics invoke her name derisively, categorizing her alongside mom, baseball, and apple pie. Art, you know, isn’t supposed to be sentimental. Moses is in no need of rescue — a 2001 retrospective at the National Museum of Women in the Arts, 50 years after death at 101, was roundly applauded. Still, she’s out of place in the hothouse of modern art. When artists such as Pollock and de Kooning were pulling worlds apart, she was putting them together. 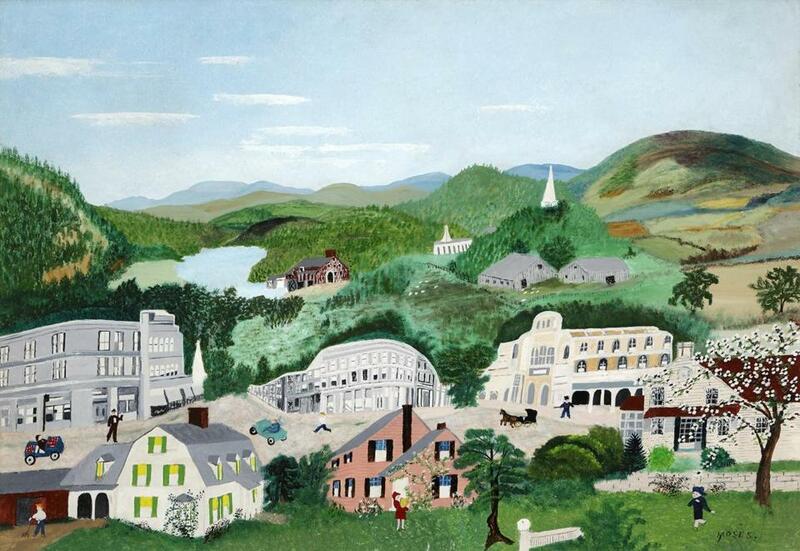 “Grandma Moses: American Modern,” up through Nov. 5 at the Bennington Museum, sets her amid a slate of modernists and post-modernists such as Joseph Cornell and Andy Warhol, as if trying to legitimize her. She’s plenty legit as she is. The museum boasts the largest public collection of Moses’s paintings (her hometown of Eagle Bridge, N.Y., is 10 miles away), and a second gallery has a perennial Moses exhibition. Visit that show; it doesn’t work as hard to make a point. Like many modernists, Moses appropriated popular imagery and used collage techniques; like post-modern Warhol, she was canny about marketing. We can attribute her fame to modernism; modernists were hot for folk art, paternalistically dubbing it “American primitive.” But she was not one of them — she was sui generis. The more than 40 Moses paintings in “American Modern” are a joyful parade, full of her sharp sense of color and design and her sly sense of humor. The works by other artists are too few to bolster the exhibition’s argument. Moses started painting in earnest in her 70s, when arthritis hampered her needlework. Collector Louis J. Caldor spotted her paintings in a local drugstore in 1938 and took her under his wing. The following year, she was curated into a private show at the Museum of Modern Art. She was 79. Before she died, she made more than 1,500 paintings. Her expansive scenes, drawn from memory and elaborated upon by imagination and compositional problem-solving, celebrate rural and small-town life. They’re full of bustle and sway, with figures that don’t have much character but do keep the eye moving. Early on, Moses copied from Currier and Ives. As she developed, she collected imagery from postcards and magazines, using carbon paper to transfer outlines to prep her painting. For a portion of “Bennington,” she cribbed a fish-eye photo. She used her signature perspective, gazing down on the scene, but kept a city block in its fish-eye-induced form. Strangely small amid its neighbors, it looms upward with classical gravitas. Another terrific painting, “The Quilting Bee,” depicts the harmonious buzz of activity in a great room, with quilters at one table and dinner being laid at another. Moses creates a rhythm with the tabletops and the characters around them that echoes the artist’s view of the gathering — like the cooks and the quilters, she’s a benevolent creator. Of the other artists here, she links most closely to Cornell (who, like Moses, was not formally trained). They both have a cut-and-paste aesthetic, but she didn’t share — and perhaps had no interest in — the subversive psychological slant of his work. Other folk artists on view have more in common. A Joseph Pickett painting of a Pennsylvania town has a similar elevated perspective and chock-a-block buildings, albeit in a humid yellow palette Moses never employed. Moses probably would have kept on painting in her own way had Caldor never discovered her. Despite the Hallmark cards and Grandma moniker (the show asks why feminists didn’t embrace her; going by “Grandma” didn’t help), her work stands up. Sarah Braman’s “Driving, sleeping, screwing, reading,” another kind of homey landscape, is the opening salvo of “In the Abstract,” at Massachusetts Museum of Contemporary Art. Braman constructs a shelter with a truck cap for a roof, sunset-colored translucent walls, and a carpet inside. It put me in mind of a long, gorgeous road trip. “In the Abstract” is the type of show that comes around every five or 10 years to take painting’s pulse. This one hinges on abstraction as it morphs into three dimensions and squirms over screens. It’s mostly full of smart surprises. There was one disappointment. My expectations were high for Rodney McMillian’s “A beckoning: We are not who we think we are,” an immersive, walk-through painting. Well — it’s really just a blue-and-green tunnel. But the rest of the show gratifyingly complicates painting. It’s long since a rule of thumb that you don’t need paint to make a painting, but something must resonate within the medium’s broad outlines of surface, support, color, genre, and gesture. 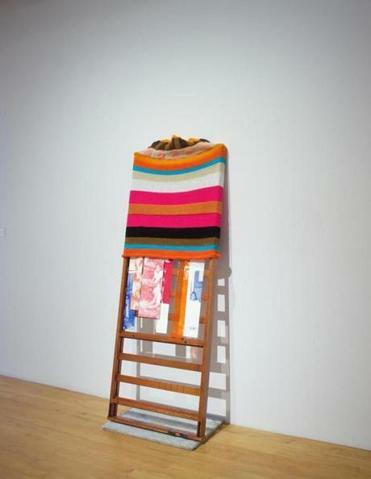 Tomashi Jackson’s “Upright, Colored, and Free” is at Mass MoCA. Braman does it by invoking landscape. Matt Saunders’s video installation “Reverdy/ King Hu” combines painting, photography, and more in luscious, jittery videos veering from abstraction to Eadweard Muybridge-style stop motion animation. Tomashi Jackson looks at racism through the lens of color theory in startlingly painterly textile works embedded with photos of children in segregated classrooms in the 1940s and desegregated ones in the 1950s. Sixty years ago, painting was just about painting. It still springs from those roots, but my, how its scope widens.